CONNALLY, Thomas Terry (Tom), (step-grandfather of Connie Mack III), a Representative and a Senator from Texas; born near Hewitt, McLennan County, Tex., August 19, 1877; attended the public schools; graduated from Baylor University, Waco, Tex., in 1896 and from the law department of the University of Texas at Austin in 1898; admitted to the bar in 1898 and commenced practice in Waco, Tex. ; moved to Marlin, Falls County, Tex., in 1899 and continued the practice of law; served as sergeant major in the Second Regiment, Texas Volunteer Infantry, during the Spanish-American War; member, State house of representatives 1901-1904; prosecuting attorney of Falls County, Tex. 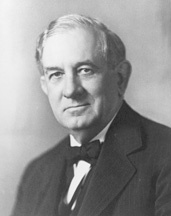 1906-1910; during the First World War became captain and adjutant of the Twenty-second Infantry Brigade, Eleventh Division, United States Army 1918; permanent chairman of Texas Democratic State convention in 1938; elected as a Democrat to the Sixty-fifth and to the five succeeding Congresses (March 4, 1917, until March 3, 1929); did not seek renomination in 1928, having become a candidate for Senator; elected as a Democrat to the United States Senate in 1928; reelected in 1934, 1940, and again in 1946, and served from March 4, 1929, to January 3, 1953, was not a candidate for renomination in 1952; chairman, Committee on Public Buildings and Grounds (Seventy-third through Seventy-seventh Congresses), Committee on Foreign Relations (Seventy-seventh through Seventy-ninth and Eighty-first and Eighty-second Congresses); member and vice chairman of the United States delegation to the United Nations Conference on International Organization at San Francisco in 1945; representative of the United States to the first session of the General Assembly of the United Nations at London and to the second session at New York in 1946; engaged in the practice of law in Washington, D.C., where he died on October 28, 1963; interment in Calvary Cemetery, Marlin, Tex. American National Biography; Dictionary of American Biography; Connally, Thomas T. My Name is Tom Connally. New York: Thomas T. Crowell Company, 1954; Smyrl, Frank. Tom Connally and the New Deal." Ph.D. dissertation, University of Oklahoma, 1968.